Award-Winning one-man play about African American Actor, singer and civil rights activist is playing in North Hollywood as part of Black History Month tour. 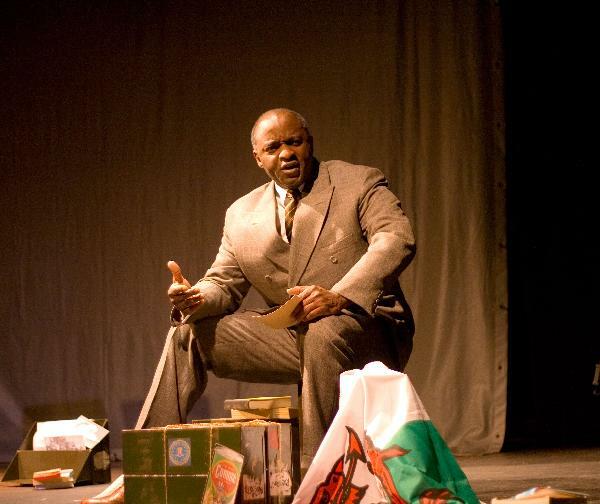 Thus starts a review of CALL MR. ROBESON at an international Fringe Festival in Brighton, UK, at which the play picked up TWO AWARDS. Call Mr. Robeson is being performed at NoHo Actorsâ€™ Center between February 19 and 21, 2010, as part of a West Coast Black History Month tour, generously supported by the International Longshore and Warehouse Union, of which Paul Robeson was made an honorary member in 1943. Written and performed by British Nigerian actor/singer, Tayo Aluko, Call Mr. Robeson is a roller coaster journey through Robesonâ€™s remarkable and eventful life, and highlights how his radical activism caused him to be disowned and disremembered, even by the leaders and descendants of the civil rights movement. It features some of his famous songs and speeches, including a dramatic rendition of Olâ€™ Man River and a spectacularly defiant testimony in front of the Senate House Un-American Activities Committee. Live accompaniment will be provided on piano by Los Angeles based pianist, organist and arranger Mr. Mark Henley, who plays piano and organ at various churches in the LA area, including New Hope Presbyterian, Home Assembly and Jacobâ€™s Ladder Church. He is also the choice accompanist for several visiting gospel artistes. Call Mr. Robeson was last seen at the DC Arts Center in Washington, DC, where it was previewed in the Washington Post and was selected as a â€œTOP PICKâ€� by the DC Theater Scene reviewer, who described it as â€œAn invigorating and rich story for novice and scholar alike. Aluko seems to almost channel Robeson's fury as he takes the stand for justice and equity. A must-see experience, a treasure of a showâ€�.